Throwing on a "simple" sweatshirt and skirt combination is really a great choice for someone like me. I own several of these pieces already and it feels like a ready-to-go outfit without much effort. On the days where I need to get ready fast (which is practically everyday) I feel less like I got ready in 5-minutes, especially when prints and color are involved. Indeed. Effortless, timeless and chic. Love the combo of pink and prints here! So pretty! I love the pink sweat shirt! I love the combination of a jumper & skirt - great for warmth if baring legs and it's still not quite warm outside :) lovely style! Hey doll, love the mixing of the different prints. Your star skirt is adorable. Has an effortless/comfortable feel to it! P.s thanks for your venue tips :) Planning a wedding is crazy! The sweatshirt is even better when it's in such a pretty color! Love this one! Great outfit, love the chic relaxed look. Great blog. Great skirt! The star print is so interesting! I don't know how you do it but you can probably make a potato sack look so chic! I have such a tough time with wearing sweatshirts because of the baggy fit. Love this outfit !! I think longer length skirts look so classy and I also really love that slide you have in your hair it looks so pretty !! Such a fun and funky combo! I especially love those vans and the hot pink! i love the look! i think it's a great combo! I am loving that punchy pink and print of your skirt Nancy! Looks awesome girl! I'm loving your sweatshirt and skirt together! Pink is a gorgeous color on you! I love the combination of pink and leopard. You look great! 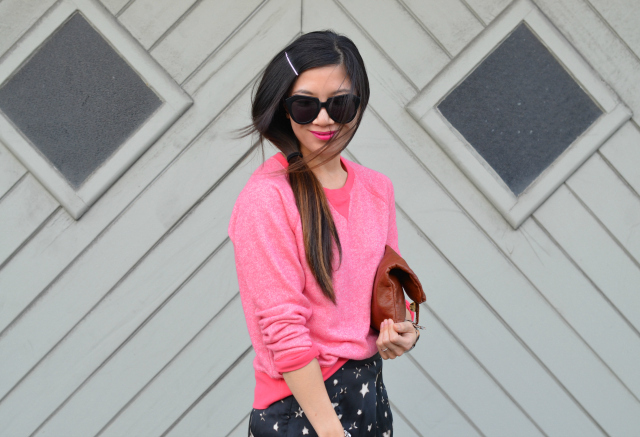 Loving this sweatshirt the way you styled it! The color is prefect!